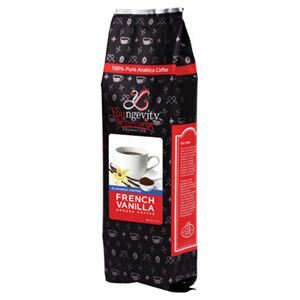 Our French Vanilla, naturally-flavored gourmet coffee is creamy and flawlessly balanced with a rich and mouthwatering vanilla flavor, that will sweeten your daily cup of Joe. Ground Coffee. Sweeten up your cup of Joe with a creamy cup of our French Vanilla. This gourmet coffee blend is made with pure, natural flavors that provide a balanced, rich and creamy vanilla-taste that will entice you daily. Youngevity’s Be The Change Coffee is grown and harvested at our very own plantation in the high-mountainous region of the Nicaraguan rainforest. It is grown under the strictest standards ensuring the best 100% Pure Arabica, Rainforest Alliance Certified™, Fair Trade Certified™, and environmentally-friendly coffee is produced.